We offer a wide range of financing options designed to make your solar system fit your energy needs and your finances. A solar lease is a contract between a homeowner (known as the “lessee”) and a third party (aka the “lessor”). The homeowner rents the solar equipment from the lessor, and the lessor installs and maintains the solar equipment. 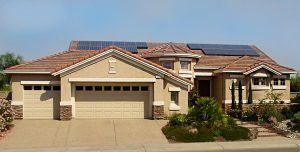 In exchange for making monthly payments over the course of the agreement (typically 20 years), the homeowner gets all the clean, solar energy produced from the system installed on his/her property. The primary benefit of leasing solar equipment is that you’re required to put little or no money down. Aside from freeing up your hard-earned money for other uses, the typical “no-money-down” provision means you don’t have to buy energy today that you’ll use 20 years down the road. A Power Purchase Agreement is a contract between a homeowner and a third party who is known as the “solar services provider.” Unlike a lease, though, the homeowner agrees to purchase all the energy produced from the solar array installed on his/her property (the host property) rather than making monthly lease payments for the equipment. In exchange, the solar services provider installs solar photovoltaic panels or solar thermal panels and maintains them over the course of the contract period. The contract term for a PPA is usually between 15 and 20 years and requires little or no money down. The homeowner agrees to pay a certain price per kWh for the electricity produced, and there is often a rate escalator of 2.5 to 3.5% per year (unless you pre-purchase the energy). However, the terms, rate, annual escalator, and term length should all be negotiable.